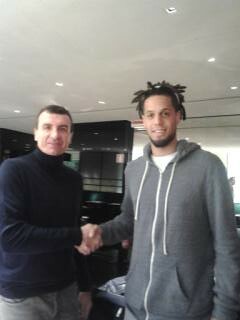 Pallacanestro Olimpia EA7 Emporio Armani Milano agreed on terms with Daniel Hackett, previously at Mens Sana Siena. He signed a 3-year deal expiring on June 30, 2016.
WHO IS HACKETT – Daniel Hackett was born in Forlimpopoli on December 19, 1987. A combo guard very versatile, he grew up in the Victoria Libertas Pesaro youth system. He moved to the States in 2003 to play for the St. John Bosco High School in Bellflower at Los Angeles. He played there until 2005 graduating one year earlier and then attending the University of Southern California since the 2006/07 season. As a freshman he scored 20 points against North Carolina in the NCAA Tournament. The 2007/08 his season was partially riunendo byte a serie of injuries but he was able to play the NCAA Tournament and to close the year at 8.3 points and 3.2 assists per game. In his junior season he averaged 12.3 points per game with 4.7 assists and 4.2 rebounds per game, leading USC to the college first-ever PAC 10 championship. At the end of the season he declared for the NBA draft. Hackett finished his college career assists the fifth best free throw shooter in USC history at 80.7%. In 2009 he signed for Benetton Treviso staying there for only one season at 4.3 points and 1.6 assists per game. In 2010 he came back to Pesaro averaging 14.3 points per game, his personal best so far, and 2.1 assists. The following season he averaged 11.2 points per game plus 3.6 assists and 3.5 rebounds per game, leading the team to the semifinals losing to Milano 3-1. The move to Siena took place in the summer of 2012. He won both the Italy Cup and the championships conquering the MVP trophies in the process. He also won as MVP the Supercup 2013. This season he was averaging 14.3 points per game with his career highs in three-point shooting (44.4%), rebounds (5.2) and assists (5.6) and in index rating (20.1). NOTES – His college coach was Tim Floyd, who also coached Chicago and New Orleans in the NBA. He played along future NBA players OJ Mayo, Nick Young, Taj Gibson, Gabe Pruitt… As a member of the Southern California All Stars he won the MVP trophy in the Big Time Tournament in Las Vegas… In 2007 he won the bronze medal at the Under 20 European championships in Gorizia. In 2011 took part in the European championhips in Lithuania with the Italian National team and in 2012 he contributed to the team qualification for the next European championships as an undefeated team… His father Rudy attended Syracuse University and was a third round pick by St. Louis in the ABA where he remained one year and by New Orleans in the NBA. He spent one season in the NBA playing for New Jersey and Indiana. Then he moved to Italy playing for Forlì, Livorno, Reggio Emilia and Porto San Giorgio.